"What really disturbs me is I feel like he's an outside individual who knows nothing about Philadelphia and its specific public safety issues or whatever public safety crisis it's facing comes in with his agenda and backs a far-left candidate who has never prosecuted a criminal case in his 30 year career as a criminal defense attorney," Grossman told the Washington Free Beacon. "Everyone is entitled to the best defense that they can get, but this individual, my opponent, has also sued the Philadelphia police department in the city over 75 times and he dislikes law enforcement." Grossman went on to say that the role of the district attorney's office is to enforce laws and not to conduct a "grand social experiment." "So you have that kind of agenda along with George Soros, and suddenly—the role of the DA's office is not to conduct a grand social experiment, it is to enforce the laws of the commonwealth of Pennsylvania justly and fairly, and to protect the constitutional rights of everybody: victims, witnesses, as well as those accused of crime." 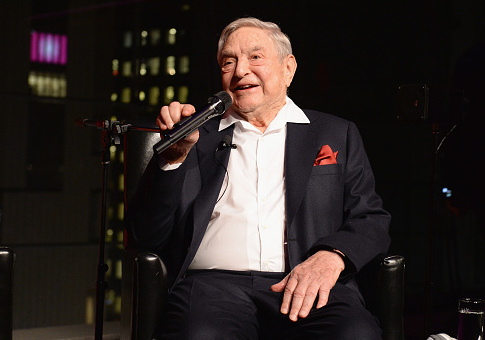 "He [Soros] blows into town—he dumps millions of dollars into this. There are volunteers—I don't know whether he pays them or where they come from—who come in and try to get people to the polls and pass out literature, and then they leave town. I have concerns, if he gets elected, my opponent, I don't want us to turn into a Baltimore," said Grossman. "I don't want us to turn into a Chicago. It's really disturbing—we have one of the finest public defenders offices in the country, we don't need two." The Philadelphia Justice & Pubic Safety PAC also reported nearly $50,000 in "unpaid dues" in mid-June to the Justice & Public Safety PAC, a committee that is also registered at the D.C. law offices of Perkins Coie. Wymas, the Philadelphia PAC's operator, is listed as the treasurer of the Justice & Public Safety PAC, according to its records. Krasner's campaign did not return a request for comment. A message sent to Soros's foundation asking about his practices of financing district attorney races was not returned by press time. This entry was posted in Issues and tagged 2018 Election, Democratic Donors, George Soros, Pennsylvania, Philadelphia. Bookmark the permalink.